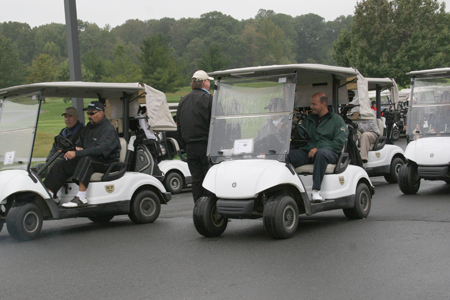 West Windsor, N.J. -- For the first time in years, clouds and showers ruled the skies, but did not dampen the spirits of the 80 participants who came out for MCCC's 19th Annual Golf Classic on Oct. 5. Hosted by the Athletics Department at Mercer Oaks Golf Course, the event raised funds that will be donated to the MCCC Student-Athlete Scholarship Fund. Last year tournament proceeds assisted 51 student athletes with their college education. The tournament is held in memory of area physician, Dr. Cynthia Schaffer, who served on the MCCC Foundation Board and was an ardent sports enthusiast, especially in golf and youth tennis. The afternoon on the course was followed by a banquet dinner, which included a silent auction of donated sports and other valuable items, and the presentation of awards by MCCC Athletics Director John Simone. Simone noted that athletics plays a valuable role at the community college level. "Participation on a sports team is both an academic motivator and a character builder," he said. "This showing of community support encourages our athletes to stay on track academically and continue on a productive path." Tournament winners included the foursome of Scott Spiezle of Spiezle Architecture Group Inc., Michael Wargo, Brian Keane and Matt Wolski. Awards were also given for second place, longest drives for men and women, and closest-to-the-pin on four holes. Addressing the assembled guests, Foundation Chair E. Karen Kennedy expressed her gratitude to this special group that has made MCCC student athletes a priority - both the dedicated members of the Golf Committee and the event's many golfers. Also participating in the festivities were MCCC Vice President Guy Generals and Executive Dean Diane Campbell. Community members who served on the Golf Committee included Doug Borden of Borden Perlman Insurance Company; David Fraytak of Faridy, Veisz, Fraytak Architects; E. Karen Kennedy; Thomas Kull; Timothy Losch of The Bank; Nina Melker of Bank of Princeton, Scott Needham of Princeton Air Conditioning, Inc.; and Steve Ritzau. Many generous corporate and individual sponsors contributed to the event. Target sponsors, whose donation included a tournament foursome and a tee/green sponsorship, were: Architectural Window Manufacturing Corporation; Borden and Perlman Insurance; Coryell Tree Service; Faridy Veisz Fraytak, P.C. ; Harrison-Hamnett, P.C. ; Honeywell; Steve Ritzau; Spiezle Architecture Group Inc.; and Tom Kull. 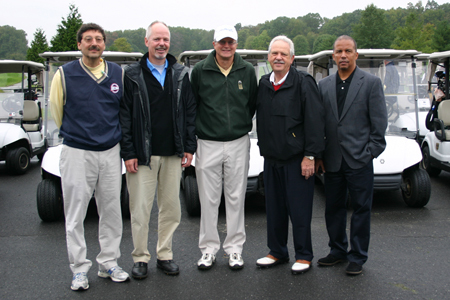 Foursome sponsors included Thomas Edison State College, Philadelphia Insurance Company, Great Eastern Technologies, and Merrill Lynch. Tee and Green Sponsors were: Bank of Princeton; Griffith Electric Supply Co.; Haldeman Dealerships; Hopewell Valley Community Bank; Kucker Haney Paints; Mrs. G; Pisauro Levy Palumbo CPAS, P.A. ; Robert Wood Johnson University Hospital at Hamilton; Roma Bank; Ronald A. Curini Appraisal Inc.; the Family of Dr. Cynthia Schaffer; and Stark & Stark. At the tournament, from left, are MCCC Athletics Director John Simone, Golf Committee members Scott Needham, Steve Ritzau, and Dave Fraytak, and MCCC Vice President Guy Generals. MCCC athletes came out to meet, greet and thank participants. 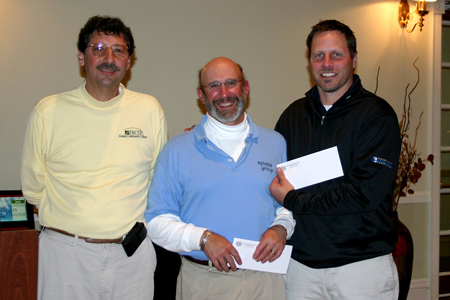 foursome were Brian Keane and Matt Wolski. Other special contributors included: The Haldeman Dealerships/Brian Bennett as Hole-in-One Sponsor; Mohawk Carpet as Lunch Sponsor; Princeton Air Conditioning Inc. as Beverage Cart Sponsor; Terminal Construction Company Inc. as Cocktail Party Sponsor; and AAA Mid-Atlantic as Golf Ball Sponsor. Additional donations were received from Whitehorn Financial Group Inc.; J. Harrison Morson; E. Karen Kennedy; Clarke Caton Hintz, PC, and Bob Humes. Those contributing gifts and silent auction items included Mrs. G; Morgan Stanley; Jo Jo's Tavern; Mike Wargo; Tom Kull; Pratico Jewelers/Mark Pratico; and Dave Fraytak. Last year was an exceptionally successful one for MCCC's eight teams. Five earned Garden State Athletic Conference titles and three won Region 19 championships and competed at national tournaments. Four students were named All-Americans and three were named Academic All-Americans. Thirty-one athletes transferred to four-year schools, making this the college's largest transfer groups ever, according to department statistics.